Chances are if you have a 31 December year end you will have to pay for your annual return on or before next Monday 29th October. If you do you may notice the Companies Registration Office (CRO) will not accept your cheque which could mean you miss your CRO filling deadline, incur late filling fees and loose audit exemption. 1. Pay the filling fee with a credit or debit card online on CORE when filling any returns with the CRO. 2. 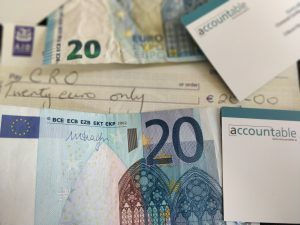 Set up an account with the CRO, anytime you want to lodge your annual return lodge cash in the CRO office in Dublin or transfer money to your CRO account by bank transfer. Make sure to notify the CRO by email when making a bank transfer. 3. Ask us to pay the CRO fee on your behalf, we have set up a dedicated client bank account which you can transfer your CRO fees to and have an account set up with the CRO to pay the fees on your behalf. Please contact me if you need any help with filling any annual returns, strike off documents or new company documents with the CRO. #Brexit what is a customs EORI number and how to get one?